We need you! 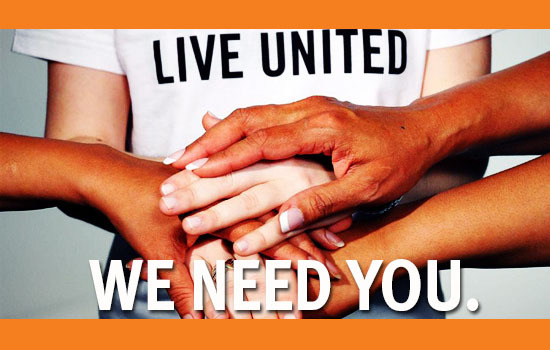 Volunteers are the backbone of United Way of Lake County. United Way's mission to improve the quality of people's lives in Lake County is fueled by people who bring passion, expertise and resources to make this happen. Please consider giving some of your time and talent to create lasting solutions that improve life for everyone by serving as a volunteer on our 2019 Community Investment Committee. We are currently accepting applications for Community Investment volunteers now through Friday, January 18, 2019. Make a lasting difference in our community. Your volunteer work will be interesting, meaningful and ABOVE ALL, crucial to our community. If you are interested in volunteering, please scroll down to the bottom of the page to complete our volunteer form and one of our team members will get back with you! Donations made to us are used to fund the most critical issues facing our community, which is where our Community Investment Volunteers come in. The goal is to ensure we fund only programs that are effective, efficient and result in positive outcomes that benefit our residents. The second single most frequently asked question we receive is, "Who decides which programs will benefit from my donation?" - to which we are proud to report that it is our volunteers who determine which agency programs receive funding. As a volunteer member of our Community Investment Committee, you will help make these decisions. We are currently in the process of recruiting volunteers to serve on our 2019 Community Investment Committee and hope you will consider donating your time to this important process. Special skills are not required to volunteer. All that’s needed is a passion for helping the residents of our community. We are accepting applications now through Friday, January 18, 2019. Volunteers must be able to participate throughout the entire evaluation process which will take place in 2019, beginning in early February and running through mid-May, for funding which will begin on July 1, 2019. We want to hear from you! If you are interested in volunteering, please scroll down and fill out the online form below -OR- click here now to download the paper registration form. That's it! We would love to have you as a volunteer and hope to hear from you! If you are interested in volunteering on our Evaluations & Investment Committee, what panel are you most interested in serving on?